Abstract: Why do some nonviolent revolutions lead to successful democratization while others fail to consolidate democratic change? And what can activists do to push toward a victory over dictatorship that results in long-term political freedom? Several studies show that nonviolent revolutions are generally a more positive force for democratization than violent revolutions and top-down political transitions. However, some nonviolent revolutions, such as the Arab Spring revolution in Egypt, do not seem to fit this pattern. This study takes on this puzzle and reveals that the answer lies in large part in the actions of civil society prior to and during transition. Democracy is most likely when activists can keep their social bases mobilized for positive political change while directing that mobilization toward building new political institutions. About the author: Dr. Jonathan Pinckney is a Post-Doctoral Research Fellow at the Institute of Sociology and Political Science at the Norwegian University of Science and Technology (NTNU), an external associate at the Peace Research Institution of Oslo (PRIO), and a research fellow at the International Center on Nonviolent Conflict (ICNC). He previously worked as a research fellow at the Sie Cheou Kang Center for International Security and Diplomacy, where he supervised data collection for the Social Conflict Analysis Database (SCAD) and the Nonviolent and Violent Campaigns and Outcomes (NAVCO) 3.0 data project. 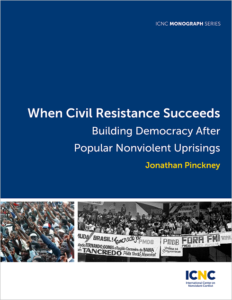 Jonathan researches resistance movements in non-democracies. His work has been published in the Journal of Peace Research, Foreign Policy’s Democracy Lab, and the edited volume Wielding Nonviolence in the Midst of Violence. 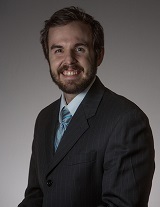 Jonathan received his PhD in International Relations from the University of Denver in March 2018. He was a 2012 recipient of the Korbel School’s Sie Fellowship and a 2016 recipient of the ICNC Ph.D. fellowship.